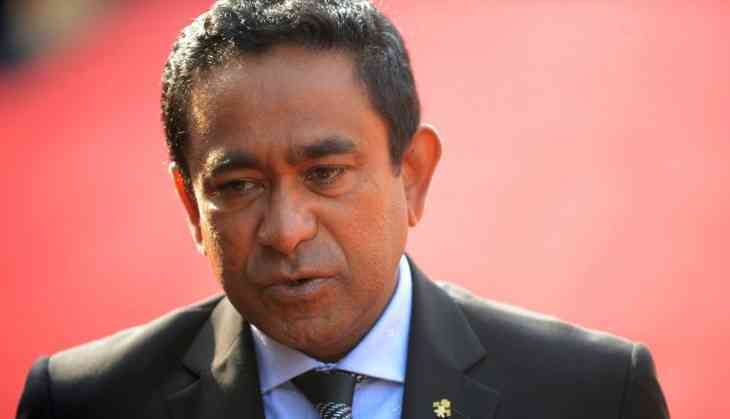 The political situation in the island nation of Maldives has been swinging from the tragic to the farcical in the last two months as President Yameen struggles to retain his hold on power. Having sent his nemesis – former President Nasheed – to 13 years prison on an utterly bogus charge of ‘terrorism’, Yameen thought that the remaining leaders could either be persuaded or bought off or brow-beaten into submission. Former Vice President Ahmed Adeeb, who was part of the ruling coterie at the time, has now revealed that the charges against Nasheed were “masterminded under direct government scheming and influence”. As if the world did not know! Though the statement is utterly unsurprising, what is new in his revelation is that he has agreed to make the declaration in a court of law thereby undermining the very essence of the ‘terrorism’ charge. The other key opposition figure Qasim Ibrahim has also been imprisoned on and off in the month of April on charges that could not be substantiated before the court. However, what Yameen could not digest was the opposition of his own family patriarch – former President Maumoon Abdul Gayoom, also the president of the ruling party, who now heads the Joint Coalition in defence of democracy in the Maldives. Gayoom’s son Faris Maumoon, who was an MP, too quit the ruling party and joined the Opposition’s bid to impeach the Speaker Abdullah Maseeh. He was arrested on 18 July and still remains in police custody. On the same day, the Elections Commission (EC) declared that four other MPs, who defected from the ruling party to the opposition in March, April and July had lost their seats, and announced by-elections. On 20 July, the four MPs appealed the EC’s decision at the Supreme Court. One month since the lawmakers lodged their appeal, the apex court is yet to announce a ruling. The EC’s declaration regarding the four MPs followed a controversial Supreme Court ruling on 13 July. That ruling stated that MPs who were elected on a political party ticket would lose their seat if the EC notifies Parliament that the MP has either left their party, been expelled, or switched parties. However, the Supreme Court also specifically clarified that the ruling could not be applied retrospectively. The Elections Commission’s declaration that the MPs had lost their seats, in effect, contradicted the Supreme Court’s ruling. To make matters worse, they were all arrested between 24 and 28 July and remanded in police custody for 15 days before a crucial vote of no-confidence against the Speaker, scheduled for 31 July. A week prior to this, on 24 July, the National Defence Force locked up the gates of the Parliament and prevented entry of all MPs, which was not only in violation of the Constitution but against all parliamentary norms and was unprecedented in the history of the island nation. Several MPs who resisted and tried to force their entry were bodily removed and arrested. The military siege of Parliament was in effect on 31 July and as the MPs trooped in, they saw the Speaker sitting behind a phalanx of soldiers. The session was adjourned within two minutes without taking up the main order of the day – the no-confidence motion against the Speaker. The President was afraid that his party MPs would desert him in large numbers and impeach the Speaker. Now the Opposition is more than united and determined not only to impeach the Speaker but the President himself. After the Joint Opposition submitted 45 signatures out of 85, the majority has stayed at 44 with 1 MP claiming that it was not his signature. They need only 43 signatures to impeach the Speaker. Out of the 41 MPs left in President Yameen's camp, the current view is that not more than 28 or so MPs are on his side, with reports that a good number are ready to cross the floor at the "right time" or when it’s "safe". Since the President’s support in Parliament has collapsed, he has resorted to increasingly illegal means to control the legislature. Most recently, the Prosecutor General charged 13 opposition MPs with “obstruction of police duty” for trying to enter Parliament. If found guilty, the charges carry a maximum sentence of one year in jail and the lawmakers also stand to lose their seats. All this leads to serious doubts as to whether at all President Yameen would hold the Presidential elections scheduled for September 2018 or clamp down a total emergency and put all the Opposition MPs behind bars. Yameen is fully aware of his dwindled support base among the people. This was evident in the local council elections held in the country in early May this year. The Maldivian Democratic Party won a landslide victory with 294 seats against the ruling Progressive Party of Maldives who bagged 208 seats. The Opposition’s fears are not without a basis. They are truly concerned that the Supreme Court – and in particular Chief Justice Abdulla Saeed – is subverting the Parliamentary process by deliberately delaying its ruling in the case of the four MPs. Parliament has been in deadlock since the EC’s unlawful announcement removing the four lawmakers. To compound their fears, there are reports that the Chief of the Defence Forces, Major General Ahmed Shiyam – whose troops stormed Parliament last month – is also threatening the Justices to rule in favour of President Yameen. While the situation in Maldives continues to deteriorate beyond repair, what is most depressing is the utter silence of Government of India on the matter. The present government in Delhi that came to power on the promise of a ‘muscular foreign policy’ has time and again showed utter inability to stand up to any cause and/or to any foreign leader. If we cannot stare down a tin-pot dictator like Yameen who rules an area half the size of Janakpuri, a colony in Delhi, what kind of ‘muscular policy’ are we talking about? It’s rather sad that we not only let down our friends who are fighting for democracy and civil rights but also we put up with a President who is providing naval bases to China. A President and who stands approvingly besides Nawaz Sharif when he criticises India for the breakdown of the SAARC mechanism from the 'soil of Male'. It’s time our policy makers woke up to the brewing storm in the Maldives and reined in the sickly President before he commits greater horrors on his people.